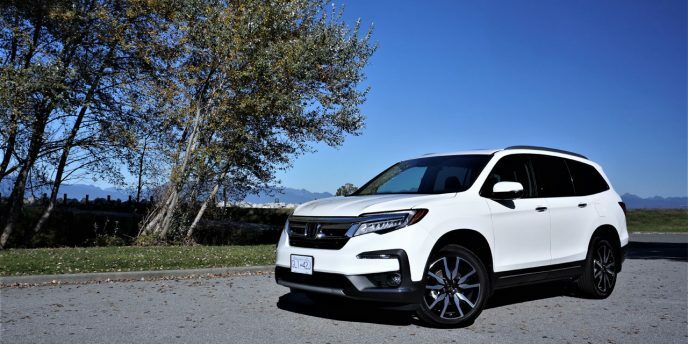 In classic Honda fashion, the update from third-generation 2016-2018 Pilot 1.0 to 2019 Pilot 2.0 is ultimately subtle, but somehow the changes made have resulted in a wholly better looking crossover SUV. The new Pilot’s mid-cycle makeover adds a more assertive looking truck-like grille above a stronger front bumper and fascia design, which tie in better to other models throughout Honda’s lineup. The new look is further improved by a wonderfully complex set of full LED headlamps in top-line Touring trim, sporting Honda’s signature vertical elements for a whole new level of sophistication when compared to lesser trims. Incidentally, trims below Touring get standard low-beam-only LED headlights that feature a less distinctive projector-style design, while an attractive set of updated LED tail lamps are the same with all trims, these positioned above a new rear bumper. 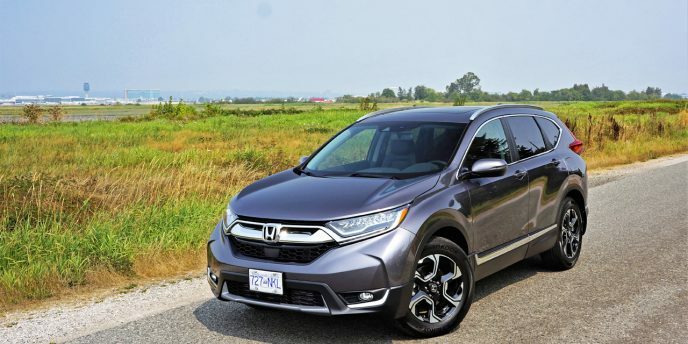 Additionally, silver skid plates below both front and rear bumpers toughen up the look of most trims, while matte and glossy black versions of the same garnishes adorn base and Canadian-exclusive Black Edition versions respectively, while Honda adds a little bit of extra exterior chrome to Touring trim, including bright metal door handles, and new 20-inch machine-finished alloys with black painted pockets that result in a more upscale look from front to back. All of these small details have really added up to a handsome mid-size crossover SUV, and while it remains a large three-row family hauler that can actually fit real adults in its rearmost seats, the Pilot somehow appears light and lithe, as if it’s actually fun to drive. Rather than just refreshing the styling and leaving at that, Honda went further by improving the auto start-stop system in top-tier Touring and Black Edition trims, so that it shuts off and restarts the engine quicker and with less fanfare, a fix that should cause more owners to leave it engaged and therefore do a better job of minimizing fuel consumption and emissions. I’m a big fan of that, and never had a problem with this feature throughout my test week. Likewise, my top-line Pilot Touring tester’s updated nine-speed automatic transmission performed flawlessly, delivering what seemed to be smoother more effortless shifts when tooling around town or cruising along the highway, and feeling more precise when flicking through the gears on the highway. This said I never had a problem with the outgoing nine-speed when testing it in a 2017 model, but some have complained about refinement and therefore Honda made improvements that should appease such disgruntled owners. Base LX, plus mid-range EX and EX-L Navi owners would have had no such issues due to their Pilots incorporating Honda’s time-tested six-speed autobox, while the one-size-fits-all 24-valve, SOHC 3.5-litre V6 is about as seasoned as modern-day engines get, remaining quite potent for the class at 280 horsepower and 262 lb-ft of torque, and kitted out with direct-injection, i-VTEC, Variable Cylinder Management (VCM) that shuts off a bank of cylinders under light loads to improve fuel economy, plus an Active Control Engine Mount (ACM) system to help reduce noise, vibration and harshness levels, which it seems to do effectively. Thanks in part to standard Intelligent Variable Torque Management (i-VTM4) AWD, supported by Honda’s Intelligent Traction Management System, the latest Pilot felt as sporty off the line as its new look lets on, while it carried that newfound nimbleness through fast-paced corners with an easy, composed nonchalance that defied its near full-size proportions, combining this agile handling with a thoroughly comfortable, compliant ride that only became unsettled when pushed beyond what’s reasonable on a particularly poorly paved section of curving roadway. Driven at calmer speeds my Pilot Touring tester was not only ideally stable and thoroughly comfortable, but came very close to achieving its claimed Transport Canada five-cycle rating of 12.4 L/100km in the city, 9.3 on the highway and 11.0 combined, with my weeklong average being 11.7 L/100km of mostly city driving on flat roadways. Of note, six-speed models are estimated to achieve 13.0 city, 9.3 highway and 11.3 combined. Factoring in new carbon tax-infused pump prices, these numbers are quite good for such a large utility. I didn’t have opportunity to tow a trailer during my test week, but take note there’s no difference in ability with either transmission, the Pilot’s rating set to 1,588 kilograms (3,500 lbs) in base form or 2,268 kg (5,000 lbs) when fitted with its available towing package. Hauling in mind, the Pilot provides plenty of cargo space for all your load carrying needs, with 524 litres (18.5 cubic feet) behind the third row, or 510 litres (18.0 cubic feet) with the Touring and Black Edition; 1,583 litres (55.9 cubic feet) when that 60/40-split third row is folded flat; plus a range from 3,072 to 3,092 litres (108.5 to 109.2 cubic feet) when both rear rows lowered, but take note that models with second-row captain’s chairs are missing a centre section that may need to be gapped when trying to fill it fully with gear. Some others with this problem attach a carpeted extension to the backside of one seatback that can be flipped over the open section of load floor when filling with cargo, but no such innovation was shown here. These sliding and reclining captain’s chairs, which straddle a slightly raised floor-mounted console with cupholders and shallow bin, don’t come standard in Touring trim, but instead replace a regular bench seat that’s good enough for three adults abreast. The model tested, therefore, only provided for seven occupants, whereas the base version is one of the more capable family haulers thanks to eight available seatbelts. I’ve tried both, and the captain’s chairs are certainly more comfortable, thanks in part to fold-down armrests and seat heaters. I also appreciated the much more open and visually airy interior provided by the big panoramic sunroof included with Touring and Black Edition upgrades—all other trims but the base model include a regular powered moonroof up front. Features in mind, top-tier $52,690 Touring trim comes well stocked, with items not yet mentioned including a more advanced set of LED high beam-infused headlamps, power-folding auto-dimming side mirrors, blue ambient lighting inside, front window acoustic glass to subdue NVH levels, rain-sensing wipers, an electronic gear selector, ventilated front seats, a premium 600-watt audio system with 11 speakers including a subwoofer plus 5.1 Surround Sound, wireless device charging, Honda’s ultra-useful new CabinTalk in-car PA system (it really works well), HondaLink Subscription Services, a Wi-Fi hotspot, the “How much Farther?” app, a rear entertainment system, HDMI input jack, a 115-volt rear power outlet, blindspot monitoring with rear cross-traffic alert, plus more. Additionally, features pulled up from EX-L Navi trim to the Touring model including an acoustic windshield, memory-linked side mirrors with reverse tilt, a heatable steering wheel rim, a four-way powered front passenger’s seat, navigation, satellite and HD radio, front and rear parking sensors, the heated outboard second-row seats noted earlier, one-touch third-row access buttons that make getting in and out of the rearmost seating area ultra-easy, second-row sunshades, a powered tailgate and more, while items pulled up from EX trim include LED fog lights, LED turn signals within the side mirrors, roof rails, illuminated vanity mirrors, a Homelink garage door opener, a leather-wrapped steering wheel rim, a 10-way powered driver’s seat with memory, and the just noted power moonroof. Lastly, I should also mention a number of standard $41,290 Pilot LX features that are also part of the Touring trim package, such as a remote engine starter, keyless proximity access, pushbutton ignition, a windshield wiper de-icer, an overhead console-mounted conversation mirror that doubles as a sunglasses holder, tri-zone automatic climate control, three-way heatable front seats, the HondaLink Assist Automatic Emergency Response System, and the list goes on (all prices are sourced from CarCostCanada, where you can also get all the latest rebate info as well as dealer invoice pricing that could save you thousands). Particularly notable, all Pilot trims feature a large 7.0-inch TFT multi-information display (MID) within a mostly digital gauge cluster, the former featuring bright and clear high-resolution colour graphics, plus easy operation via steering wheel-mounted controls, while the 8.0-inch tablet-style infotainment touchscreen atop the centre stack is even more fully featured, starting with a wonderfully colourful array of tile-like graphics that appear to be inspired by the iPhone and iPad. The inclusion of standard Apple CarPlay is therefore fitting, although take note that Android Auto is also standard, plus Bluetooth smartphone connectivity with streaming audio, a superb multi-angle rearview camera with dynamic guidelines, and more. Part of that ongoing features list includes a whole host of standard Honda Sensing advanced driver assistance systems such as automatic high beams, Adaptive Cruise Control, Forward Collision Warning, Collision Mitigation Braking System, Lane Departure Warning, Lane Keeping Assist System, and Road Departure Mitigation, which means that together with the Touring model’s cornering-capable full LED headlights the 2019 Pilot now achieves a best-possible Top Safety Pick Plus rating from the IIHS (last year’s versions didn’t achieve the “Plus” or “+” rating), while it also received a five star safety rating from the NHTSA. While most everything I’ve said thus far has been positive, I was somewhat surprised that the Pilot only provides soft touch synthetic surfacing across its dash top, as well as a piece on the instrument panel just ahead of its front passenger that wraps overtop the centre display, and the front door uppers, plus of course the usual door inserts and armrests. This means the rear door uppers were hard plastic, which is strangely low-rent for this class, while some rivals even go so far to provide the pliable synthetic treatment to the lower dash including the glove box lid, while also wrapping the A pillars in fabric to improve refinement further. On the positive, the driver’s seat was very comfortable, but this said its two-way powered lumbar support didn’t meet up with the small of my back, so I didn’t use it the way I would if it also adjusted for height. Speaking of seats, I should say more about the third row that actually was quite comfortable, with plenty of legroom for a five-foot-eight adult (with long legs and a shorter torso), about three to four inches available for the knees when the second row was pushed back to its rearmost position, and loads of headroom. My last and final complaint won’t be an issue for many Pilot owners, but I found it odd that Honda expended so much energy (and money) creating the Touring (and Black Edition) model’s electronic gear selector yet didn’t replace the foot-operated parking brake with an electromechanical unit. It’s not like lifting the foot and pressing down on a parking brake is a big negative, but it certainly ties what is otherwise a modern and advanced vehicle to the past. I’m guessing Honda will replace it for the next generation Pilot, so I, like some others, will look forward to this upgrade. And yes this is where I need to say, if a foot-operated parking brake, two-way lumbar support, and a little more hard plastic than I’d like to see is all I can find to complain about after a weeklong test, Honda is doing pretty well with the new Pilot. All in all this is easily the best Pilot I’ve ever driven, and one of the more competitive crossover SUVs in its three-row mainstream volume class. I like its new styling, appreciate the amount of effort Honda’s engineers put into refining the new model’s drivetrain and suspension, and therefore enjoyed my time behind the wheel. It’s certainly an easy SUV to live with thanks to ample passenger and cargo space, while its fuel economy didn’t put me in the poorhouse. For these reasons and more the 2019 Pilot is easy to recommend. I said this before and I’ll say it again, the new Accord is the most attractive car in its midsize sedan class, and one of the best looking to ever be sold in this segment. Not only that, I find it better looking than a lot of premium-branded sedans, and wouldn’t doubt that some who might have never purchased in this class before will now consider doing so solely because it exists. This scenario may have played out on Canada’s sales charts last year, with the Accord being the only mid-size sedan to see growth from January 2018 through December’s end. OK, its archrival Toyota Camry barely escaped the red by growing a scant 0.1 percent over the same 12-month period, but Accord deliveries were up 2.4 percent during an era that’s seen the mid-size sedan decimated by crossover SUV popularity. This last point was evidenced by other Accord competitors seeing their market shares eroded significantly, the next best-selling Chevy Malibu’s sales down 16.3 percent, followed by the Fusion dropping 34.8 percent, the Nissan Altima lower by 21.4 percent, the Hyundai Sonata by 33.6 percent, Kia Optima by 27.5 percent, Volkswagen Passat by 29.5 percent, Mazda6 by 9.8 percent, and Subaru Legacy down by 28.1 percent. That’s an unbelievable level of mid-size sedan carnage, but the new Accord solely rose above it all. Of course, there’s a lot more to the 10th-generation Accord than just good looks. There’s an equally attractive interior filled with premium levels of luxury and leading edge electronics, plus dependable engineering borne from decades of production and non-stop refinements. The first hybrid drivetrain was introduced as an option to the seventh-generation Accord way back in 2005, skipped a generation and then came back as an option with the ninth-gen Accord in 2013, and now it’s here again. As with previous iterations, the latest Accord Hybrid looks much the same as the conventionally powered model, which I appreciate because it’s not trying too hard to stand out and keeps the Accord’s attractive styling intact. Truly, the only noticeable difference is a removal of tailpipe finishers, the Hybrid featuring some discrete chrome trim in their place. Chrome in mind, both no-name Hybrid and Hybrid Touring trims feature the same chrome exterior details as the regular Accord’s EX-L and above trims, Sport model excluded. Touring upgrades that aren’t as noticeable include full LED headlamps that feature light emitting diodes for the high as well as the low beams, plus unique signature LED elements around the outside of the headlamp clusters, chrome-trimmed door handles, and the availability of no-cost as-tested Obsidian Blue Pearl exterior paint instead of standard Crystal Black Pearl or $300 White Orchid Pearl, the only two shades offered with the base model. Now that we’ve got the obvious visual changes from base Hybrid to Hybrid Touring trims out of the way, the top-line model also replaces Honda’s exclusive LaneWatch blind spot display system with a Blind Spot Information (BSI) and Rear Cross Traffic Monitor system, while adding adaptive dampers to improve handling, rain-sensing wipers, a head-up display (HUD), an auto-dimming rearview mirror, passenger side mirror reverse gear tilt-down, a HomeLink garage door remote, a powered moonroof, front and rear parking sensors, navigation, voice recognition, satellite and HD radio capability, HondaLink subscription services, wireless device charging, an AT&T Wi-Fi hotspot, driver’s seat memory, a four-way powered front passenger’s seat, a heatable steering wheel rim, perforated leather upholstery, ventilated front seats, heated rear outboard seats, and more for $40,090 plus freight and fees. 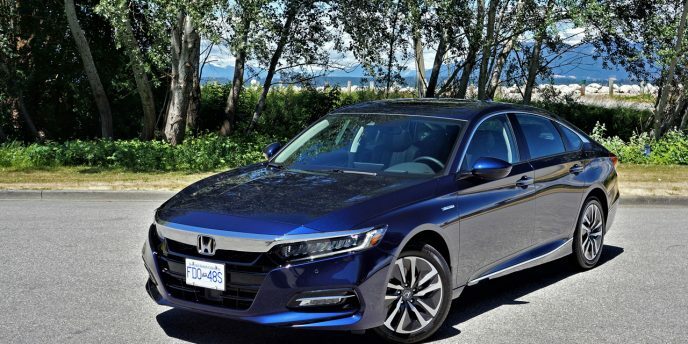 Incidentally, I sourced 2019 Honda Accord Hybrid pricing from CarCostCanada, which not only breaks everything down into trims, packages and standalone options, but also provides information about available rebates as well as dealer invoice pricing that could save you thousands. Additionally, items pulled up to the Hybrid Touring from base $33,090 Hybrid trim include unique aerodynamically designed machine-finished 17-inch alloy wheels, auto-on/off headlight control with automatic high beams, LED fog lamps, LED taillights, a remote engine starter, proximity-sensing keyless access with pushbutton ignition, a leather-wrapped multifunction steering wheel, a 7.0-inch colour TFT multi-information display within the primary gauge cluster, dual-zone automatic climate control, an 8.0-inch infotainment touchscreen with tablet-style tap, swipe and pinch gesture controls, Apple CarPlay and Android Auto smartphone integration, a multi-angle rearview camera with dynamic guidelines, Bluetooth phone connectivity with streaming audio, near field communication (NFC), 452-watt audio with 10 speakers including a subwoofer, two front and two rear USB charging ports, SMS text message and email reading functionality, Wi-Fi tethering, overhead sunglasses storage, a 12-way powered driver’s seat with four-way powered lumbar support, heatable front seats, the HondaLink Assist automatic emergency response system, plus all the expected active and passive safety features including front knee airbags. Some safety features that might not be expected include the standard Honda Sensing suite of advanced driver assistance systems, incorporating Adaptive Cruise Control (ACC) with Low-Speed Follow, Collision Mitigation Braking System (CMBS), Forward Collision Warning (FCW), Lane Departure Warning (LDW), Road Departure Mitigation (RDM), Lane Keeping Assist System (LKAS), and traffic sign recognition, this being enough to earn the regular Accord a Top Safety Pick from the IIHS when equipped with its upgraded headlights, while all Accord trims get a best-possible five stars from the NHTSA. The long list of Accord Hybrid Touring features comes in a cabin that exudes quality and refinement, thanks to premium-level soft synthetic surfacing on most surfaces above the waste, authentic looking matte woodgrain inlays spanning the instrument panel and door panels, tastefully applied satin-silver accents throughout, supple leather upholstery on the seats, door inserts and armrests, padded and stitched leatherette trim along the sides of the lower console, the front portion protecting the inside knees of driver and front passenger from chafing, and some of the highest quality digital displays in the class. Immediately impressive is the brightly lit primary instrument package that looks like a giant LCD panel at first glance, but in fact houses a digital display within its left two-thirds while integrating an analogue speedometer to the right. The screen on the left is filled with hybrid-specific info by default, but you can scroll through numerous other functions via steering wheel controls, resulting in a very useful multi-info display. Likewise you can project key info onto the windshield via the HUD by using another steering wheel button, the system showing graphical information for route guidance, the adaptive cruise control system and more up high where you can see it without taking your eyes off the road. Over on the top portion of the centre stack, Honda’s new infotainment interface has become a personal favourite amongst mainstream volume brands, thanks to high definition displays, wonderful depth of colour and contrast, plus fabulous graphics, the elegantly arranged tile system easy to figure out and plenty attractive to look at. Being a hybrid, a number of cool animated graphic sections are included, while the navigation system’s mapping was excellent and route guidance easy to input and precisely accurate, plus the backup camera was equally clear and dynamic guidelines helpful. Yes, I would’ve appreciated an overhead 360-degree bird’s-eye view, but the ability to see a variety of views thanks to its multi-angle design, no matter the trim, is a bonus that others in the class don’t offer. The final digital display is Honda’s dual-zone automatic climate control interface, which is attractively designed in a narrow, neatly organized, horizontal row that includes an LCD centre display, three knurled metal-edged rotating knobs, and a variety of high-quality buttons for the HVAC system and heated/ventilated front seats. I should mention that all of the Accord Hybrid Touring’s switchgear was excellent, and much of it beautifully finished with aforementioned satin-silver detailing, while the audio system knobs got the same grippy and stylish knurled metal treatment as those used for the HVAC interface. Much of the design shows an artistically flair too, particularly the recessed speaker grille behind the fixed tablet style display atop the dash, and the 3D effect used to raise the top buttons on the HVAC interface above those below. At the very base of the centre stack is a little cubby filled with a 12-volt power outlet, a charged/connected USB port and a wireless charging pad that’s large enough for big smartphones like the Samsung Note series. Interestingly Honda has done away with the classic old auxiliary plug, replacing it with near field communication (NFC) as noted earlier, and three more USBs, the second one found within the centre storage bin under the armrest, which includes another 12-volt charger as well. The bin has a nice removable tray as well, which feels very high in quality and is rubberized so that it doesn’t rattle around like so many others in this class. This is just one of many details that let you know the Accord’s quality is above average. The leather seats are nicely styled with perforations the three-way forced ventilation noted earlier. The driver’s was extremely comfortable, with good side support for this segment and excellent lower back support. On that note I was surprised that Honda not only includes a power-adjustable lumbar support with fore and aft control, but it’s a four-way system that also moves up and down to ideally position itself within the small of your back. That’s unusual in this class, even when compared to some premium models like the Lexus ES 350 and more directly comparative ES 300h hybrid that only include two-way powered lumbar. Likewise for the Toyota Camry and Camry Hybrid, plus a few others in this segment that don’t measure up either. The seating position is good, probably on par with the aforementioned Camry, but I must say neither is excellent when it comes to adjustability. Their steering columns don’t offer enough reach, forcing me to power my seat too close to the pedals in order to achieve optimal comfort and control of the steering wheel. We’re all made differently, and I happen to have longer legs than torso. The compromise was a more upright seatback than I would have otherwise liked, but doing so allowed ample control and decent comfort, so this is how I drove all week. Controlling the gear selector is a lot easier, although if you’re not familiar with Honda’s new assemblage of buttons and pull levers it’ll take some getting used to. The Accord Hybrid comes standard with the complex selector, and while it might be a bit confusing at first try I recommend giving it a little time before getting flustered. I’ve had a lot of opportunity to use this system in a variety of Honda models, the new Odyssey and Pilot immediately coming to mind, while it’s similar to the system used in new Acura models, so now I don’t swear at it when trying to find reverse in the middle of a U-turn. Other than the pull lever-type electromechanical parking brake found at its rearmost section, it consists of three pushbuttons, for park, neutral and drive, and another pull lever for reverse. I almost never use neutral, simplifying the process further, so it’s a tug on the lever for reverse and a simple press of the large centre button for drive or park, that’s it. Next to the parking brake there’s another set of buttons for Sport, Econ and EV modes, plus a brake hold button. I left it in Econ mode most of the time and EV mode whenever it would allow, because this is what hybrids are all about, saving fuel and minimizing emissions and cost. This said the Accord Hybrid is one of the thriftiest vehicles I’ve driven all year, only costing me $24 after a week’s worth of very thorough use, and that’s when gas was priced at an outrageous $1.55 per litre. At today’s slightly more agreeable prices it would allow even more savings, its claimed 5.0 L/100km city, 5.0 highway and 5.0 combined fuel economy rating one of the best in the non-plug-in industry. So what’s all the mechanical and electrically charged wizardry behind its superb fuel economy? A unique two-motor hybrid powertrain joins an efficient 2.0-litre Atkinson-cycle four-cylinder engine to provide the Accord Hybrid with a class leading total system output of 212 horsepower, while its electric drive motor puts 232 lb-ft of near instantaneous torque down to the front wheels. To clarify, one of the electric motors drives the front wheels, while a smaller secondary motor serves mainly as a generator, providing electric current to the drive motor in order to supplement or replace power from the battery during lighter loads, such as cruising. The second motor also starts the engine that in-turn adds torque to the wheels, but it’s never used as the motive driving force for those wheels. Additionally, the car’s Electric-Continuously Variable Transmission, or E-CVT, removes any need for a conventional automatic transmission, or even a traditional belt/chain-operated continuously variable transmission (CVT), both of which inherently rob performance and efficiencies from the powertrain. Instead, Honda’s E-CVT drives the front wheels directly through four fixed drive ratio gearsets, without the need to shift gears or vary a planetary ratio. This means there is no “rubber-band” effect when accelerating as experienced in regular CVTs, or in other words the engine is never forced to maintain steady high rpms until road speed gradually catches up, this process causing a much-criticized audible “droning” effect with other CVT-equipped cars. Honda claims its direct-drive technology benefits from 46 to 80 percent less friction than a conventional automatic transmission, depending on the drive mode. What’s more, you can choose between three standard propulsion modes as well, including electric-only (providing the 6.7-kWh lithium-ion battery is charged sufficiently), gasoline-only, or blended gas and electric (hybrid). Despite my favouritism for Econ and EV modes, Sport mode worked very well, making itself immediately known after engaging at a stoplight by bringing the engine back to life from its auto start/stop mode, and then boosting acceleration significantly at takeoff. A set of standard steering wheel paddles improves the driving experience further, although flicking the right-side shifter to upshift while accelerating does nothing perceptible, this because the paddles are primarily for downshifting during deceleration. Therefore, tugging on the left paddle when braking, or pretty much any other time, causes a gear ratio drop that really comes in handy when wanting to engine brake or recharge down a steep hill, or when setting up for a corner. And I must say the Accord Hybrid handles brilliantly for a car in this class. Really, the only vehicle in this segment with more agility around curves is the latest Mazda6 and possibly the Ford Fusion Sport, and these by the narrowest of margins, with Accord Hybrid seeming to dance away from its closest competitors, including the Toyota Camry Hybrid XSE that I tested earlier this year, which is the sportiest version of that car. The Accord Hybrid handles long, sweeping high-speed corners well too, while its ability to cruise smoothly on the highway is as good as this class gets. It’s underpinned by the same fully independent front strut and rear multi-link suspension as the conventionally powered Accord, while my tester was once again outfitted with the upgraded adaptive dampers for a little more at-the-limit control and enhanced ride quality. This gives it a wonderfully compliant setup where ever you’re likely to drive, whether soldiering over bumpy back alleys, fast tracking across patchwork pavement, or negotiating wide bridge expansion joints, all of which were experienced during my test week. My only complaint were front parking sensors that continually went off in regular traffic, highlighting an image of the car’s frontal area on the touchscreen when vehicles were merely pulling up beside me in the adjacent lane. I’ve encountered this problem with a few other cars over the past couple of years, and it’s always annoying. I pressed the parking sensor button off and on again, which remedied the problem until it happened again after a couple of days, at which point I rebooted the system the same way and never had to deal with it again. This foible and the aforementioned lack of telescopic steering reach aside, the Accord Hybrid was a dream to live with. The rear seating area, a key reason many buy into this class, is as spacious as the regular Accord and more so than many in this segment. With the driver’s seat set up for my five-foot-eight medium-build frame, which as noted was set further back than average due to my longer legs, I was left with nearly a foot from my knees to the backrest ahead, plus so much room for my feet that I was able to completely stretch out my legs and move my shoes around underneath the front seat. Really, its rear legroom comes close to many full-size sedans. Likewise, there’s plenty of headroom at about three and a half inches, plus more than enough shoulder and hip space at about four to five inches for the former and five-plus for the latter. This said I was disappointed that Honda finished off the rear door uppers in hard plastic. They’re not alone in this respect, but others do a better job pampering rear occupants. The previously noted Mazda6, for instance, at least in its top-line Signature trim level that I tested last year, which incidentally uses genuine hardwood inlays throughout, finishes the rear door panels as nicely as those up front, making it closer to premium status than anything else in its class. In most other respects the Accord nudges up against premium levels of luxury too, including excellent rear ventilation from a centre panel on the backside of the front console that also houses two USB charge points, while the outboard seats are three-way heatable as noted earlier, and there’s a nice big armrest that flips down from the centre position at exactly the right height for adult elbow comfort, or at least it was perfect for me. Honda fits two big deep cupholders within that armrest, which should do a pretty good job of holding drinks in place. The trunk is sizeable too at 473 litres (16.7 cubic feet), which is exactly the same dimensions as the regular Accord, plus it’s also extendable via the usual 60/40 split-folding rear seatbacks. This said there are still some hybrids that don’t allow much expandable storage due to batteries fitted within the rear bulkhead, so I can’t really complain that Honda doesn’t include a centre pass-through like Volkswagen’s Passat, which would allow rear passengers to enjoy the heated window seats after a day on the slopes. On the positive, a handy styrofoam compartment resides below the trunk’s load floor, ideal for stowing a first aid kit or anything else you’d like to have close at hand. It comes loaded up with an air compressor that could potentially get you to a repair shop if needed, but I’d personally prefer a spare tire so I could make it farther if damage to the tire doesn’t allow it to hold air. So is this the best hybrid in the mid-size class? The new Accord Hybrid would certainly get my money. It looks fabulous, delivers big inside, and provides all the luxury-level features most will want, plus it drives brilliantly and delivers superb fuel economy, while Honda’s experience building electrified powertrains should make it plenty reliable. The minivan is a strange beast. After the segment’s first foray into the market during the early ‘80s to mid-‘90s, when the various Chrysler group vans took their rightful place atop the heap thanks to creation of the category itself, and follow up models that continued to deliver what consumers wanted better than competitors that merely modified existing Japanese vans for differing North American tastes, each automaker continued to augment their offerings to better appeal to what were essentially their most practical buyers. Honda was actually a full decade late to the party, having arrived in 1994. The first-generation Odyssey certainly looked the part and even boasted second-row access from both sides, something Chrysler wouldn’t adopt until the following year, but the Japanese van’s rear side doors were hinged like those from the Accord it was based on, and therefore it lacked the ease-of-use provided by all competitors’ passenger-side sliding door, limiting its popularity. Fortunately for Honda, its imported competitors weren’t all that much more appealing, Toyota’s original Van a truck-based body-on-frame rear- and four-wheel drive alternative that nevertheless found a reasonable following, this replaced by the ovoid spaceship-styled Previa that stowed its engine on its side under the driver’s seat, and finally the more conventional front-drive Sienna for the 1998 model year; and Nissan’s first Van similar to Toyota’s yet nowhere near as successful, things getting better when the FWD Quest was launched in 1992; whereas Mazda’s 1989-2006 MPV was probably the most capable Japanese-sourced Chrysler competitor. Chrysler group vans aside, the domestics did better than they probably should have thanks to the brand strength of Ford and GM at that time, the blue-oval Aerostar and Chevy/GMC Astro/Safari RWD and AWD truck-based models finding reasonably strong sales ahead of the General’s plastic-bodied 1990-1996 APV/“Dustbuster” atrocities that didn’t catch on very well despite Chili Palmer’s (John Travolta) Cadillac of minivans plug in Get Shorty (1995), whereas Ford’s 1995-2003 Windstar actually had fairly strong success. Ford only suffered through one more minivan name-change when it redubbed its stellar offering Freestar before saying goodbye to the non-commercial minivan segment altogether in 2007, but I could fill volumes with GM minivan names before it decided to say goodbye to its final Buick Terraza, Chevrolet Uplander, Pontiac Montana SV6, and Saturn Relay foursome in 2009. And don’t worry I won’t comment on all the others, or for that matter the various brands not yet mentioned that tried their hardest to build the ultimate family hauler, because now there are only a handful of competitors in this once hotly contested sector. The only brand not yet noted that’s still making a minivan is Kia, which launched the Sedona in 2002. Hyundai briefly tried to cash in with its oddly named 2006-2009 Entourage, but that one-stint-wonder leaves the Sedona amongst just two Kias not duplicated by a namesake version from its parent brand (the other being the Soul subcompact crossover, whereas Hyundai is alone in offering a three-door sports coupe in the Veloster). The Sedona is the minivan segment’s least popular offering, mostly due to the strength of Kia’s brand rather than any specific product shortcoming, having found just 5,286 Canadian buyers in 2017 and 4,478 over the first three quarters of 2018. Comparatively, Chrysler’s much pricier Pacifica raised its game to 6,185 unit sales last year and 5,327 over the first nine months of this year, while the Odyssey is the first of this quintet to break five figures thanks to 11,232 deliveries in 2017 and 9,036 as of September 30, 2018. Having built up a minivan following for ten more years than Honda, it’s only fair the Sienna sells in greater numbers, the Toyota van finding 15,470 buyers last year and 11,231 registered by the end of this year’s third quarter, while the minivan that started everything off way back in 1984 remains number one by a long shot, Dodge having sold 46,933 Grand Caravans in 2017 and 27,466 year-to-date as of Q3 2018. I’ve driven most every van mentioned plus a dozen or so more, and some that looked sportiest were the least capable off the line and around curves, whereas others were sleepers. My short-wheelbase 1996 Caravan was actually pretty decent when the road started to wind, but its 3.0-litre Mitsubishi-sourced V6 and four-speed automatic combination wasn’t anywhere near as capable as today’s V6 powerplants. The latest Grand Caravan gets a 283 horsepower 3.6-litre V6 with 260 lb-ft of torque, but that engine is the only sophisticated bit of kit in the aging workhorse. It stacks up pretty well when compared to the Odyssey’s 3.5-litre V6 that makes 280 horsepower and 262 lb-ft of torque, but that’s where the driveline similarities end. Specifically, Honda’s “Earth Dreams” branded V6 incorporates Variable Cylinder Management cylinder-deactivation that cuts half the pistons under light loads where Chrysler never adapted its comparative MDS system to the Pentastar V6, while Honda’s new nine- and 10-speed automatics are the cream of the minivan crop, the latter gearbox included in my Touring trim tester. Competitive transmissions include a six-speed automatic from Dodge, eight-speed units from Kia and Toyota, and a nine-speed from the conventionally powered Chrysler with a CVT used for its plug-in hybrid variant, that latter model providing the segment’s best fuel economy at 7.3 L/100km city, 7.2 highway and 7.3 combined (or 2.6, 3.0 and 2.8 Le/100km if you plug-in all the time and don’t drive very far between charges), albeit for a substantive initial hit to its bottom line (it starts at $51,745 and rubs up against $65k when fully loaded), while the Odyssey and its considerably more affordable rivals offer up city/highway/combined estimates of 13.7/9.4/11.8 for the Grand Caravan (the segment’s worst city and combined ratings), 12.9/8.4/10.9 for the base Pacifica and 12.4/8.4/10.6 for the same drivetrain with engine start/stop, 12.7/10.0/11.5 for the Sedona (the worst highway rating), 12.5/8.9/10.8 for the Sienna (or 13.4/9.6/11.7 for the Sienna AWD), and finally 12.6/8.4/10.7 (tied-for-best highway rating) for the base Odyssey with its nine-speed, or alternatively the best-in-class city, second-best highway and tied-for-best combined ratings of 12.2/8.5/10.6 for the as-tested top-line Odyssey with its 10-speed automatic. On top of this technical advantage, the Odyssey continues forward as the best minivan choice for those wanting a large dose of performance added to their ample helping of practicality. Clarifying this sporting image are paddle shifters behind each steering wheel spoke in every trim level, this from a utilitarian class that usually makes you feel lucky to receive any shifter control at all. Why this minivan-first inclusion of paddles? Take a look at the centre stack and everything becomes clear, with Honda’s pushbutton gear selector replacing the old lever that previously offered a regular push-and-pull manual mode. Now driver engagement takes place without the need to remove hands from the thick and sporty leather-wrapped steering wheel rim, the nicely contoured driver’s seat providing the other key ingredient for comfort and control. The driving position is excellent, and thanks to 12-way power-adjustment including four-way powered lumbar support on EX trims and above the driver’s seat should be just as comfortable for those measuring four-foot-eight to six-foot-eight as it was for my five-foot-eight frame. Its many adjustments combined nicely with the tilt and telescopic steering column’s ample reach, allowing me to ideally saddle up my sometimes-awkward long-legged, short-torso build. The gear selector is basically the same as used in the Pilot mid-size crossover SUV, a design that works flawlessly once you get used to it. It does take some practice, however, so if you’re going on a test drive at your local dealer give yourself enough time to get familiarized or you may be frustrated, especially if you have to back up quickly in the middle of the road during a U-turn, where all of a sudden you’ll need to think about pulling a rocker switch rearward for Reverse before pushing another button to select Drive. When you push the Drive button twice it goes into Sport mode, and this is the best way to make use of those aforementioned paddles. The 10-speed autobox really does snap through the gears quickly, which is kind of rare for transmissions with so many speeds. Normally they’re laggards, set up to maximize fuel economy at all costs, but as long as you haven’t pressed the ECON mode button, which does a good job of minimizing fuel usage, or the Snow mode designed to maximize traction in slippery situations, this one is really fun to drive, making the most of all the power on tap. Combined with the Odyssey’s nicely balanced fully independent front strut and rear multi-link suspension, it’s easily the class leader for performance. Refinement is a bit more difficult to quantify, whether talking about ride quality or interior fit, finish and materials quality. I have no complaints about either with the Odyssey, finding its ride pleasant enough whether running errands around town or cruising on the open freeway, despite its taut handling characteristics. As for cabin refinement, Honda finishes both the upper and mid-level instrument panel in a leather-like soft-touch synthetic that’s plenty upscale for the mainstream volume sector, this continuing rearward across the tops of each door panel, plus the inserts and armrests of course. Additionally, a pewter-look medium-grey metal-like inlay spans the dash, while piano black lacquer accents can be found most everywhere else, Touring trim notably lacking much interior chrome resulting in a sportier theme, but Honda using dark brown for much of the softer surfacing of the dash and door panels too, matching the perforated leather seat upholstery for a rich, classy look. Just the same this is the most modern van on the market. In fact, most of the primary gauge cluster is digital, a first for the class. It’s controllable via a well-designed array of steering wheel switchgear, which also includes a button for the heatable steering wheel rim, pulled up from EX-L Res trim. You’ll need to look over on the centre stack to turn on the heat or blow cool air through the front seats’ ventilated perforations, the former standard and latter exclusive to Touring trim. Before delving into everything that comes standard with Touring trim, I’ve just got to say how impressed I was with the Odyssey’s infotainment system. It starts with a fixed tablet-style design that sits above the centre stack like some premium brands do in their much higher priced models, and almost seamlessly melds the aforementioned piano black plastic surrounding trim with a black glass-like finish from edge to glossy edgy, its digital innards bright, colourful, with deep, rich contrasts, and it’s wonderfully easy to use thanks to a tile-style setup, not to mention tap, pinch and swipe gesture controls depending on the feature being used, navigation mapping being one that uses all. I was a bit surprised not to find a 360-surround parking monitor in top-line trim, but Honda’s excellent multi-angle rearview camera with dynamic guidelines comes standard, as does Apple CarPlay and Android Auto smartphone integration. I tried the latter and it was simple to set up and use, while route guidance was a no-brainer and totally accurate whether using Google’s phone-sourced directions or Honda’s proprietary system, my personal preference being the latter. All controls are touch-sensitive except for a handy rotating knob for power/volume, while Honda includes its usual array of well thought out steering wheel switchgear. USB and aux ports can be found under a sliding door in the lower console, while device connectivity is via Bluetooth or near field communication (NFC), the latter reportedly a quicker, easier process for those with compatible smartphones. Along with the upgraded 10-speed automatic transmission already noted, additional Touring trim exclusives include idle start/stop for reducing fuel consumption and emissions, unique 19-inch alloy wheels on 235/55 all-seasons, full LED high/low beam headlamps, upgraded LED fog lamps, power-folding side mirrors, rain-sensing wipers, ambient lighting on the instrument panel, within the front door handle cutouts and in the footwells, acoustic front and rear door glass, Honda’s new CabinWatch rear seat monitor, wireless device charging, HondaLink Subscription Services, an AT&T Wi-Fi Hotspot, a “How much Farther?” app, great sounding 550-watt audio with 11 speakers including a subwoofer, third-row sunshades, blindspot monitoring with rear cross-traffic assist, a hands-free gesture-controlled power tailgate, and more. The previously noted navigation system gets pulled up from EX-L Navi trim, while the EX-L Res trim doesn’t include navigation yet offers families a rear entertainment system with a 10.2-inch high-resolution WSVGA flip-down centre monitor, a Blu-ray DVD player and embedded streaming media apps, while both EX-L trims provide the aforementioned heatable steering wheel, driver’s seat memory plus memory-linked side mirrors with reverse gear tilt-down, front and rear parking sensors, satellite and HD radio, an acoustic windshield, a 12-volt power outlet for the third row, and more. There are EX and EX Res trims too, the only difference with the latter being rear entertainment plus another USB port, a household-style 115-volt power outlet, and Honda’s industry-first CabinTalk in-car PA system (the latter two features not included with the EX-L Navi), while both include unique two-tone 18-inch alloys, upgraded LED daytime running lights, fog lamps, integrated turn signal indicators within the side mirror housings, auto-up/down powered windows all-round, an auto-dimming rearview mirror, a HomeLink garage door opener, a powered moonroof, tri-zone automatic climate control, previously noted NFC, Honda’s superb LaneWatch blind spot display that unfortunately gets nixed from Touring trim due to its exclusive blind spot monitoring system, the 12-way powered driver’s seat mentioned earlier, power-sliding second-row doors, second-row armrests and sunshades, the brilliant HondaVAC in-car vacuum (the only way I’ve ever been able to get my son to use a vacuum without force), and more. In case you were wondering what you get with the Odyssey’s previously noted base price, standard equipment includes 18-inch alloys on 235/60 all-season tires, auto on/off projector-beam halogen headlamps with auto high beams, active grille shutters, a windshield wiper de-icer, variable intermittent wipers, body-coloured heated power door mirrors, chrome door handles, front splash guards, LED taillights, a rear window wiper/washer, a capless fueling system, remote engine start, proximity-sensing keyless entry and pushbutton ignition, an electromechanical parking brake with automatic brake hold, filtered dual-zone automatic climate control, the previously noted multi-angle rearview camera, a 150-watt AM/FM/CD/MP3/WMA audio system with seven speakers including a subwoofer, Bluetooth streaming audio, Wi-Fi tethering, Siri Eyes Free, HondaLink, the CabinControl app, two USB charge ports, 15 cupholders, centre console storage with a utility tray, a conversation mirror integrated within the overhead sunglasses holder, illuminated vanity mirrors, an eight-way power driver’s seat, a four-way powered front passenger’s seat, heated front seats, Adaptive Cruise Control (ACC), Forward Collision Warning (FCW), Collision Mitigation Braking System (CMBS), Lane Departure Warning (LDW), Lane Keeping Assist (LKAS), Road Departure Mitigation (RDM), tire pressure monitoring with tire fill assist, and more. 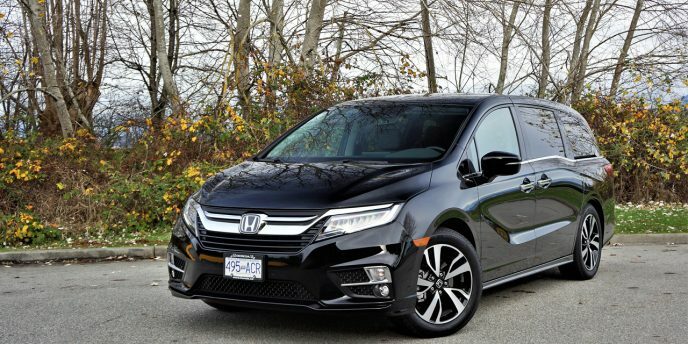 All of the Odyssey’s advanced driver assistance systems technology, as well as its many additional active and passive safety features, plus its Next-Generation Advanced Compatibility Engineering (ACE) body structure, allow for a Top Safety Pick rating from the IIHS when including its optional headlights, the only other minivan to achieve this coveted rating being Chrysler’s Pacifica, so kudos to Honda for putting safety first in this family-oriented class. Your clan in mind, the Odyssey gets eight-occupant seating standard as well, and I must say its second and third row seats are some of the most comfortable in the segment. The former row can’t be had with captain’s chairs as offered with some others, yet each side slides back and forth individually and the centre position can be folded forward, exposing a console-style combination of cupholders and tray. The outside positions slide forward and out of the way for easy third-row access too. This said they’re not as flexible for cargo as the second-row in the Pacifica or Grand Caravan that tumble completely under the floor, the Odyssey’s difficult to unlatch for removal and burdensome to carry, much like others in the category. The third row is split 60/40 and drops into the floor with one smooth motion per side, however, its stowing system one of the best in the business. By the numbers the base Odyssey provides 929 litres (32.8 cubic feet) of cargo space behind the third row, 2,526 litres (89.2 cu ft) behind the second row and 4,103 litres (144.9 cu ft) behind the first row, if you remove the middle row of seats. By comparison the Sedona delivers 960 litres (33.9 cu ft) of gear-toting space behind its third row, 2,220 litres (78.4 cu ft) behind its second row and 4,022 litres (142.0 cu ft) with the second row removed, whereas the Sienna offers 1,107 litres (39.1 cu ft) of luggage space in its rearmost compartment and 2,466 litres (87.1 cu ft) aft of its second row, the brand being honest about the challenge of second-row seat removal by not including a total volume figure behind the first row. How about those FCA vans? 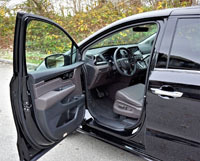 The Pacifica includes 915 litres (32.3 cu ft) behind its third row, 2,478 litres (87.5 cu ft) behind its second row and 3,979 litres (140.5 cu ft) of easily accessible cargo space behind its first row, while the Grand Caravan provides 934 litres (33.0 cu ft) behind its third row, 2,359 litres (88.3 cu ft) behind its second row and 4,072 litres (143.8 cu ft) when its Stow ‘n Go seats are easily folded below its floorboard panels. To save you a little time with a calculator, suffice to say the Odyssey sits middle of the pack for stowage behind its rearmost seats, but it leads all behind its second row, and, well, let’s leave ultimate cargo hauling to the FCA vans for now. How about towing? The Odyssey is good for 1,360 kilos (3,000 lbs) of trailer weight in all trims but the top-line Touring, my tester being capable of 1,587 kilograms (3,500 lbs) with its available towing package. That’s slightly lower than the best Grand Caravan and Pacifica trailering results of 1,633 kg (3,600 lbs), and identical to the Sienna and Sedona’s rating. I don’t usually comment much about minivan styling, but my tester’s Crystal Black Pearl paint gave it a hearse-like presence that would’ve been brilliant during Halloween yet wasn’t much to my personal taste. I’d prefer it in something less ominous like White Diamond Pearl, a $300 option yet well worth it. Honda offers a bevy of alternative metallic and pearl colours, all surprisingly standard, while only dealer-added accessories can be added to this Touring model, albeit plenty of them. This brings about the question of price, my 2019 Odyssey Touring starting and finishing at $50,690, plus freight and fees of course. Top-line versions of its non-hybrid competitors start at $46,245 for the Grand Caravan GT, $47,865 for the Sedona SXL+, $51,220 for the Sienna SE, and $53,745 for the Pacifica Limited, leaving the top-tier Odyssey looking like a pretty smart choice right in the middle. Of course, value isn’t just about a vehicle’s price even when comparing it purely on financials, because we need to include resale values when it comes time to trade-in or sell. Japanese brands in this class tend to do best on the used market, with domestics performing worst, while base prices start at $24,597 for the Grand Caravan’s rather stark Canada Value Package, $28,495 for the entry Sedona, $34,690 for the Sienna, $34,745 for the Pacifica, and $35,290 for the Odyssey. I used the various manufacturer retail websites as well as CarCostCanada to verify each model’s pricing, the latter an even more useful resource thanks to available rebate info and dealer invoice pricing that could save you thousands. After living with the new Odyssey for a week it was easier than ever to appreciate why it’s become such a popular minivan, and if I were using it more for hauling people than cargo it would be my number one choice. Even with its less flexible second row the Odyssey’s many other advantages, from performance to electronic interfaces, might push it into the lead. I certainly can recommend it. None of us should be surprised when an automaker launches a new sport utility vehicle these days, but some new entries make more sense than others. For reasons that likely have something to do with North American average sized families (which as of 2016 were estimated at 2.9 persons in Canada, and as of 2017 were 3.14 in the U.S.—which is larger than the EU’s 2.3-person average), five-passenger mid-size SUVs sell better than their larger seven-passenger siblings. For example the best-selling five-passenger Santa Fe obliterated the larger Santa Fe XL last year with 21,615 deliveries compared to just 6,787, while the next most popular Ford Edge merely nosed out the Explorer with 19,967 unit sales to 17,333. Likewise, the five-occupant Nissan Murano was ahead of the Pathfinder with 15,120 sales to 9,838, and just in case you’re wondering whether brands that only offer seven-passenger crossovers sell much more than those that provide both, consider that the Kia Sorento only sold 15,990 units, the Toyota Highlander just 15,259, the Dodge Journey 13,745, and the Pilot just 8,905. Other brands fared worse than Honda, with the Dodge Durango down at 6,505 units, GMC Acadia at 5,380, Chevrolet Traverse at 4,710, Volkswagen Atlas at 4,534 (after just seven months of sales), Mazda CX-9 at 3,943, plus a couple of stragglers not worth mentioning, but no doubt the brand that produces the CR-V, Canada’s best-selling compact SUV, and does nearly as well with the HR-V in the subcompact SUV segment, wants to find similar success in the mid-size utility class. Set to arrive in Honda dealerships across Canada early next year, the 2019 Passport will attempt to recharge the brand’s lagging mid-size sales by targeting two types of SUV buyers, those who simply want more passenger and cargo space than a CR-V can provide, without the added length of a three-row utility, and more adventurous owners who’d like to take their new SUV off the beaten track. If you’ve been watching Honda’s automotive news stream lately you’ve probably seen greater focus than usual put on off-road performance, with last month’s Ridgeline-based Rugged Open Air Vehicle Concept now seeming like a precursor to a couple of similarly styled all-terrain vehicles, the Talon 1000X and Talon 1000R, introduced alongside the new Passport on Tuesday, November 27. Those not familiar with Honda’s motorcycle and ATV divisions might find all of the above a surprise, but the idea of Honda going off-road will be nothing new to fans of the brand who were weaned on CRs, XLs and XRs, ATCs, TRXs and Four-Trax’s, and most specifically FLs, otherwise known as Honda Odysseys, which were little single-seat four-wheel off-roaders around well before anyone ever heard of a minivan (Honda also made a Pilot ATV in 1989 and 1990), and are closest in concept to the two new Talon ATVs. Tapping into Honda’s off-road heritage makes a great deal of sense for the brand’s SUV lineup as well as its sole Ridgeline pickup truck, as there’s a lot of missed opportunity for cross-marketing Honda SUVs with Honda dirt bikes and ATVs, not to mention Honda generators and water pumps that would fit nicely into camping lifestyle ad campaigns, and its lawnmowers, handheld edge trimmers, tillers, snowblowers, and more that fit ideally into the lives of home and cabin/cottage owners. The Ridgeline is the more appropriate cross-marketing product for the latter items, but the new off-road capable Passport makes a good fit for anything camping related. The new Passport would be ideal for trailering all of the recreation vehicles and handy tools noted above (see photos of it towing the new Talon and a camp trailer in the gallery), not to mention boats powered by Honda Marine outboard engines and Honda AquaTrax personal watercraft (although you’ll need to have a used one of the latter being that Honda recently pulled out of the industry), thanks to an optional tow package rated at 1,588 kilograms (3,500 lbs) for front-wheel drive models and 2,268 kilos (5,000 lbs) with all-wheel drive. What’s more, the “overhead” option found in the new Passport’s standard multi-view rearview camera makes connecting hitch and trailer easier than ever before. Off-road enthusiasts who might have considered a Ridgeline, but never a Pilot or CR-V, will find the new Passport a serious alternative to other medium-duty 4×4 capable SUVs thanks to Honda’s upgraded i-VTM4 all-wheel drive system, which uses active torque vectoring to send up to 70 percent of engine torque to the rear axle and 100 percent to either the left or right rear wheels. Honda promises handling excellence no matter the conditions, citing “rain-slicked or snowy roads or sandy trails,” whereas on pavement it also responds better by overdriving the outside rear wheels amid turns. Honda’s Intelligent Traction Management (ITM) adds another element to the Passport’s off-road prowess, thanks to four driving modes that work in tandem with the optional i-VTM4 all-wheel drive, including normal, snow, mud and sand selections. ITM is actually standard with both FWD and AWD models, although the drive modes for the former only include normal and snow settings. Also notable, the new Passport adds 13 mm (0.5 in) of ground clearance over its Pilot sibling in FWD guise, and 28 mm (1.1 in) with AWD, allowing greater ability to overcome obstacles like rocks and roots found on the trail. So how does the Passport AWD do in off-road conditions? As you can see by the photos provided with its launch material, it certainly looks more capable than any previous Honda SUV, at least anything designed and produced by Honda (let’s not forget about the 1993–2002 Isuzu Rodeo-based mid-size model of the same name that could be considered the spiritual successor to this new Passport, and the reason Honda may have chosen to dig up this old name from the mostly forgotten past. Back to the here and now, Honda thoroughly tested the new Passport in “the world’s harshest environments” like “the sands of Dubai, muddy country roads of Russia, and snowbound trails in Minnesota,” and claims that it’s “more capable off road than many unibody SUVs.” Basically they’re saying not to expect it to out-4×4 a Jeep Wrangler, but when up against a similarly equipped unibody crossover SUV that doesn’t offer a bull-low gear ratio, the combination of i-VTM4 and ITM allow AWD-equipped Passports hold their own. While all of this is fun and interesting, we all know the majority of Passport owners will never take their SUV off pavement and therefore might only ever experience slippery road conditions from rain, snow and ice. As noted earlier Honda has this covered too, while also providing the most powerful base engine in its class, which is both a boon and a bane. The automaker turns to the same i-VTEC valvetrain-enhanced 3.5-litre V6 found in the larger Pilot and Ridgeline pickup truck, not to mention the Odyssey minivan mentioned earlier. On the positive this sole engine makes 280 horsepower and 262 lb-ft of torque, and while it’s usually good to offer the strongest performance in a segment it’s not necessarily the best to come up short when it comes to fuel economy. Of course, Honda makes no official fuel consumption claims yet, but we can assume the new model will do better than the base Pilot’s 13.0 L/100km city, 9.3 highway and 11.3 rating due to weighing considerably less and featuring a standard nine-speed automatic transmission with pushbutton gear selection, instead of the more traditional lever operated six-speed unit offered in lower trims of the larger SUV. Higher Pilot trims feature the same nine-speed, and its fuel economy reflects this with a thriftier rating of 12.4 city, 9.3 highway and 11.0 combined, so the new Passport should be able to improve on the latter numbers, while providing smoother and more refined performance than four-cylinder powered competitors that achieve better mileage. As you may have guessed the new Passport rides on the same fully independent chassis as the Pilot, the Honda Global Light Truck platform consisting of a rigid unibody structure with a fully boxed floor held up by a MacPherson strut front and independent multi-link rear suspension setup, and featuring electric power-assisted rack-and-pinion steering directing standard 20-inch alloy wheels wrapped in 245/50 all-season tires in base Sport and EX-L trims or 265/45 tires in Touring and Elite trims. Of note, the Passport launch model, which was introduced as part of the Los Angeles Auto Show, was in U.S. specification and therefore Canadian-spec trims and features won’t likely be identical. The information provided shows the four trims just mentioned, clarifying them as the “well-appointed Sport, upgraded EX-L, high-tech Touring, and the fully equipped Elite,” but for comparison our Canadian-spec Pilot is offered in LX, EX, EX-L Navi, Touring, and Black Edition trims. These are mostly the same in the U.S. market, except for no Black Edition, whereas we don’t offer Elite trim, instead including all of that model’s features in the top-line Touring. Along with the 20-inch alloy wheels noted earlier, which is the standard diameter across the entire Passport line, we can safely assume that Canadian-spec models will also get the Honda Sensing suite of advanced driver assistive and safety systems as standard equipment, that includes Collision Mitigation Braking System (CMBS) with Forward Collision Warning (FCW), Road Departure Mitigation (RDM) including Lane Departure Warning (LDW), Lane Keeping Assistance System (LKAS) and Adaptive Cruise Control (ACC). These advanced electronics are joined by the industry’s usual assortment of active and passive safety features and Honda’s proprietary Advanced Compatibility Engineering (ACE) body structure, resulting in a mid-size SUV designed to exceed current crash test standards. Additional standard features available south of the 49th that should be included in our Passport include LED headlights, LED DRLs, LED fog lamps, and LED taillights, proximity-sensing keyless Smart Entry and Smart Start, a 7.0-inch digital colour TFT primary instrument cluster, a configurable multi-information display featuring audio, trip and phone info (plus turn-by-turn route guidance on models with navigation), tri-zone automatic climate control, a 5.0-inch infotainment display, the aforementioned Multi-Angle Rearview Camera with dynamic guidelines, six-speaker 215-watt audio with a subwoofer, and much more. In the U.S., Honda includes Blind Spot Information in EX-L, Touring and Elite trims, and adds Rear Cross-Traffic Detection plus front and rear parking sensors to the Touring and Elite, while additional upgrades (depending on trim) include power-folding auto-dimming side mirrors, a larger 8.0-inch infotainment touchscreen with Apple CarPlay and Android Auto smartphone integration and smartphone/tablet-style tap, swipe and pinch gesture capability, satellite-linked navigation, 4G LTE in-vehicle Wi-Fi that can support up to seven devices, wireless phone charging, 590-watt 10-speaker premium audio, various HondaLink cloud-based services such as remote unlocking, concierge services, and stolen vehicle tracking, a powered moonroof, second-row sunshades, a power tailgate with available hands-free operation, plus more. Plenty of Honda Genuine Accessories will also be available for the new Passport, many of which were shown off in the photos provided for this overview. Included are various sizes of roof storage boxes, a roof basket, plus roof-mounted bike, kayak and ski/snowboard racks, while Passport owners can also protect the cargo area with hard plastic floor, side, and seatback covers. Additionally, the storage area under the load floor can be sectioned off with individual, removable, washable bins. Honda will also be offering a number of cosmetic upgrades including a coloured graphics package, undercarriage welcome lights, and illuminated doorsills, while two accessory packages will be available as well, including The Adventure Package that adds fender flares, running boards, a trailer hitch, and more, plus The Urban Package featuring unique 20-inch alloy wheels, front and rear underbody spoilers, roof rails with crossbars, and the just noted cargo storage bins. Again, we’ll need to wait until Honda Canada reveals our Canadian-spec Passport before confirming everything on this list, but we can be certain that some, if not all of these items will be available here. As noted earlier, a key reason for stepping up into a mid-size five-occupant SUV over a compact one like the CR-V is increased interior volume, so along with more passenger volume front to back the new Passport provides 368 litres (13.0 cubic feet) of additional passenger volume over its smaller sibling, its 3,282 litres (115.9 cu ft) ahead of the rear seatbacks resulting in segment-leading status, while the Passport’s 4,448 litres (157.1 cu ft) of overall interior volume is also best-in-class. The Passport continues to lead the class when it comes to cargo hauling too, with 1,166 litres (41.2 cu ft) of luggage space behind the rear seats and 2,206 litres (77.9 cu ft) with the rear row lowered, which is also 56 litres (2.0 cu ft) more cargo space than the CR-V offers in the very back, and 60 litres (2.1 cu ft) more overall. 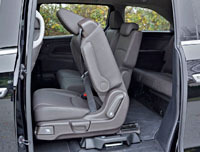 Like with the CR-V, the Passport’s 60/40-split rear seatbacks fold automatically via releases in the cargo area, but the larger SUV uses electric buttons instead of levers, while the Passport also provides a reversible cargo floor that swaps out the carpeting for an easily maintained hard plastic surface. Another segment-leading bonus is underfloor storage, which measures 71 litres (2.5 cu ft) on its own and can be accessorized as noted earlier. Stowage in mind, all Passport trims feature a large centre console bin between front occupants, while its roll top cover doubles as a handy tray when closed. There’s more centre console storage ahead of the gear selector, while the door panels provide even more places to put things. Honda promises “high-quality interior appointments” including “generous use of soft-touch surfaces on the dash and doors,” plus “attractive and durable” fabric upholstery in the base Sport model and optional perforated leather with EX-L, Touring and Elite trims. After all is said and done, no one should discount the role styling plays in automotive decision-making, and fortunately the Passport benefits from the new 2019 Pilot’s design influence. The latter is better looking than previous generations and the new Passport is arguably more so, thanks to a taller more 4×4-capable looking stance and sporty matte black used for the grille, headlights, bumpers, and wheels, plus glossy black trim in key areas, sharp looking LED headlight accents, unique floating C-pillars, and sporty chrome dual exhaust outlets. Each trim will get exclusive alloy wheel designs too, but so far there’s no word about Honda replacing some of the scratch-resistant blackened trim with dressier body-colour paint and satin-silver or chrome for a city-slicker version, but something similar makes sense for a future base model as well as alternative high-end trims. All in all it appears Honda has a winner on its hands, particularly because it targets the more popular five-passenger mid-size SUV market segment with an attractive, roomy, well-equipped entry sporting above-average performance and no shortage of high-tech features. 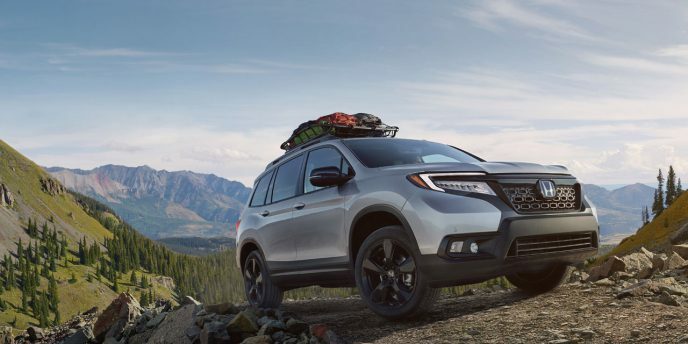 Its rugged styling and off-road capability make certain the Passport targets a different kind of customer than the smaller CR-V, and truly opens up opportunity for a more rugged Ridgeline and other more adventuresome products in the future. Hopefully this new Honda swagger is a sign of things to come. The CR-V is the best SUV in its compact class. Yes, I know I’m going out on a limb making this claim, but as of September 30, 2018 a total of 42,748 Canadians agreed with me, and this number only represented those who purchased it this year. That figure also represents the most compact SUVs sold over the first nine months of 2018, meaning that Honda is currently first in this extremely important category. Toyota, which was first last year is now runner up with 41,023 units down the road, whereas Ford’s Escape is a distant third with 34,928 deliveries, Nissan’s Rogue has only managed 32,373 sales, and the remaining 10 rivals merely in the twenty-somethings, teens and four figures. The CR-V’s success makes a lot of sense, especially the latest fifth-generation model. Its styling is certainly more upscale than previous versions, particularly when dolled up in top-line Touring trim that gets full high/low beam LED headlamps, a chrome garnish on each LED fog lamp bezel, more chrome trim decorating the side sill extensions, bright metal dual tailpipes, satin-silver roof rails, and sporty machine-finished 18-inch alloys with black painted pockets. My tester was finished in Gunmetal Metallic for a sophisticated look at no extra cost, but you can dress yours up in five alternative shades, Platinum White Pearl costing $300 extra, plus two rich looking colours. Each time I climbed inside of my 2018 tester and took it for a drive I was thoroughly impressed, just as I was with my previous 2017 CR-V Touring test model. It’s not the fastest or the best handling SUV in its class, but its cabin is finished to a higher level of refinement than the majority of its peers and it’s oh so comfortable. What’s more, it’s fitted with an almost fully digital dash, a large high-resolution infotainment system, and even gets some pretty authentic looking woodgrain trim. It’s really more about how much attention to detail has been painstakingly added, mind you, and the overall design of the interior. Finishing the top of the dash in soft-touch synthetic is nothing new in this category, but Honda goes one step further by trimming the entire instrument panel in nicely stitched leatherette with a stylish piano black inlay down the middle. To be clear, and I don’t know why they didn’t just finish it all the way across, the bolster ahead of the front passenger is soft synthetic, as is the section that stretches above the infotainment system, but the tiny piece surrounding the ignition button and another one on the left lower side of the gauge cluster is made to look identical as the others yet finished in hard plastic. On the positive, the door panels get soft touch uppers, nice padded and stitched leatherette inserts, comfortable padded armrests, and the usual hard plastic lower door panels, while the centre armrest is finished identically to those on the doors, yet quite wide and very comfortable. Speaking of comfort, the CR-V Touring’s driver’s seat is extremely good. It’s wide enough for most body types, with decent side bolstering, and even includes four-way powered lumbar support. In case you weren’t aware, you won’t even be able to get four-way adjustable lumbar with the Lexus NX, a similarly sized vehicle priced much higher than the CR-V, and this Honda’s ergonomics are much better than the pricey premium model too, thanks to more reach from the tilt and telescopic steering wheel. The comfortable seating position and fully adjustable lumbar support resulted in a vehicle I could drive all day long without pain, which is a rarer find than it should be this day and age. As part of its comfort quotient the new CR-V remains roomy and accommodating from front to back, with the rear seating area so spacious that there seems to be little need for a larger mid-size five-occupant Honda crossover SUV. It’s so roomy, in fact, that Honda offers a seven-passenger version in other markets, although all of this being said Honda has announced that a new crossover SUV, once again bearing the Passport name (remember the Isuzu Rodeo that was rebadged as a Honda Passport from 1993 to 2002? Yeah didn’t think you would), will soon be unveiled at the Los Angeles auto show. As for cargo space, the CR-V is one of the more sizeable in the compact SUV class boasting 1,110 (39.2 cubic feet) behind the 60/40-split rear seatbacks and 2,146 litres (75.8 cubic feet) when they’re laid flat. The process to lower them is as good as this segment gets too, thanks to handy levers on each side of the cargo wall that drop them down automatically. What’s more, unlike the previous fourth-generation CR-V the load floor is almost perfectly flat, and therefore much more utile. 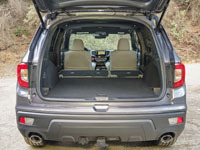 The rear portion of that floor is also removable and stuffed with a full-size spare tire and jack, although even better is the ability to lower that load floor a few inches for fitting in taller cargo. Honda provides a large panoramic glass sunroof to shed light on the CR-V Touring’s beautiful interior, not to mention ambient lighting to draw attention to key areas, while additional Touring trim exclusives that I haven’t mentioned yet include rain-sensing wipers, a really accurate and easy-to-use navigation system with nicely detailed mapping and turn-by-turn directions, bilingual voice recognition, an excellent sounding 331-watt audio upgrade with nine speakers including a subwoofer and HD radio, helpful hands-free access to the programmable height-enhanced powered tailgate, and Blind Spot Information (BSI) with Rear Cross Traffic Monitoring, which unfortunately replaces Honda’s superb and exclusive LaneWatch passenger-side blindspot camera that comes standard on EX and EX-L trims. I should mention that an entire suite of Honda Sensing advanced driver assist systems comes standard with all-wheel drive models in all four CR-V trims, and includes automatic high beams, adaptive cruise control with low-speed follow, forward collision warning with autonomous collision mitigation braking, lane departure warning with lane keeping assist and road departure mitigation. Along with the usual active and passive safety features, including Honda’s impact-absorbing Next-Generation Advanced Compatibility Engineering (ACE) body structure, so-equipped CR-V’s achieve an almost best possible IIHS Top Safety Pick rating. While Touring trim starts at $38,690 plus freight and fees, you can get into a well-equipped base 2018 CR-V LX model from $27,290, and take note there are two additional trims in between including $33,590 EX and $35,890 EX-L. Honda’s Real Time AWD with Intelligent Control System, the latter referring to an electric motor within the transmission that engages the rear wheels when front tire slip occurs, adds $2,800 in LX trim yet comes standard with the EX, EX-L and Touring. For complete pricing of trims and options, plus otherwise difficult to get dealer invoice pricing that can save you thousands, as well as useful rebate information, be sure you visit CarCostCanada. As you might have guessed, Touring trim incorporates most items from the mid-range EX, including the aforementioned fog lamps, plus turn signals infused into the side mirror housings, a HomeLink garage door opener, a 12-way powered driver’s seat, rear USB charge points, a retractable cargo cover, and more, while an auto-dimming rearview mirror, heatable steering wheel, leather shift knob, perforated leather upholstery, driver’s seat memory, four-way powered front passenger seat, heatable rear outboard seats, and some additional audio gear including satellite radio, plus the powered liftgate (sans gesture control) get pulled up from EX-L trim. I was previously surprised to find out the CR-V’s proximity-sensing keyless access and pushbutton ignition were standard across the line and the same remains true for 2018, whereas additional base LX features pulled up to Touring trim include LED taillights, an electromechanical parking brake, a configurable colour TFT primary gauge cluster, dual-zone auto climate control, heatable front seats, a high resolution 7.0-inch colour infotainment touchscreen with gesture controls like tap, pinch and swipe, Apple CarPlay and Android Auto smartphone connectivity, a multi-angle backup camera with dynamic guidelines, Bluetooth phone connectivity with streaming audio, Wi-Fi tethering, an always appreciated rotating volume knob, HondaLink Assist automatic emergency response system, plus more. I mentioned earlier that the CR-V isn’t the fastest or best handling SUV in its class, but it still should be sporty enough for most buying into this family-oriented category. Honda provides one smooth, responsive 1.5-litre turbocharged four-cylinder engine capable of 190 horsepower and 179 lb-ft of torque, which is better than average in this class, while its continuously variable automatic transmission is all about refined, linear acceleration. The CVT kicks down to provide more power and a sportier feel when needed, and doesn’t cause as much of a droning engine/exhaust note as some other CVT-equipped powertrains. What’s more, the CR-V’s claimed 8.4 L/100km city, 7.0 highway and 7.8 combined FWD fuel economy rating, and 8.7 city, 7.2 highway, 8.0 combined AWD consumption estimates make it extremely efficient. As for the ride, it’s once again smooth and comfortable, although plenty sporty through the corners. Then again I didn’t drive it quickly very often, because the CR-V simply doesn’t tease or tempt its driver to do so. I think that’s a good thing, because it could save you money when it comes to potential speeding tickets, and provides a more relaxing atmosphere that suits this type of luxury-lined family hauler. True, at 55 I’m getting older and don’t care as much about performance during my daily drives, so for me this CR-V is just about perfect. Another thing we older folks appreciate more than most in younger generations is reliability, and Honda regularly outperforms most competitors in third-party studies. For instance, the most recent J.D. Power and Associates 2018 Vehicle Dependability Study placed Honda within the top 10 of all automotive brands, and therefore above the industry average, while Consumer Reports’ latest 2018 automotive brand report card has Honda in ninth place overall and third amongst mainstream volume nameplates, beating Toyota, Nissan, Hyundai, Mazda, Volkswagen and the list goes on. Additionally, CR pointed to the new CR-V as one reason why Honda’s score improved this year. So all added up it’s no wonder Honda does so well with its CR-V. As noted earlier, it’s easily my pick for best in class, thanks to doing most everything better than its peers, from styling to interior design, finishing, quality, comfort, load flexibility and ease of use. Its electronic interfaces are excellent, while its drivetrain and suspension combo is amongst the best in the business, all resulting in one superb compact crossover SUV made all the better in top-line Touring trim. I highly recommend it.